There’s just something about a big inline-four streetbike without any bodywork. The engine and chassis on display for the whole world to see—no excuses given or needed. It’s all business, and you never get tired looking at it. Plus, it’s light, powerful, and responsive. Our all-new CB1000R is the best open-class naked street fighter we’ve ever produced. It’s like a triple-shot of espresso for your motorcycling soul. You get a high-revving 998cc four-cylinder engine that’s specially tuned for midrange and top-end power. Cutting-edge Neo-Sports Café styling, new chassis and electronics package along with relaxed and more open riding position. The new Honda CB1000R. Sometimes, less really is more. *3.95% p.a. interest rate is available for loan terms of 24 months and 36 months. 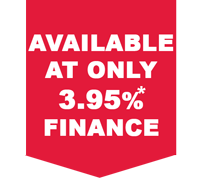 Finance offer applicable to new CB1000R model. Interest is fixed for the term of the loan. No deposit required. An application fee of $350 applies. UDC Finance standard terms, conditions and lending criteria apply. Finance products are only available to approved customers. Standard warranty conditions apply. Available at all participating authorised Honda dealers while stocks last.